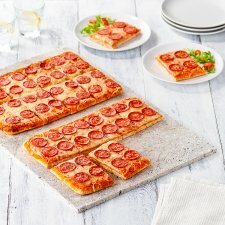 2 Pizzas consisting of a pizza base with tomato sauce, topped with mozzarella cheese, mature Cheddar cheese and pepperoni. Two pizzas with tomato sauce and topped with mozzarella and mature Cheddar cheeses and pepperoni. Wheat Flour (Wheat Flour, Calcium Carbonate, Iron, Niacin, Thiamin), Mozzarella Full Fat Soft Cheese (Milk), Water, Pepperoni (10%), Tomato Purée, Semolina (Wheat), Tomato, Rapeseed Oil, Mature Cheddar Cheese (Milk), Yeast, Salt, Onion Powder, Black Pepper, Oregano. Pepperoni contains: Pork, Durum Wheat Semolina, Salt, Dextrose, Paprika Extract, Cayenne Pepper, Antioxidants (Rosemary Extract, Sodium Ascorbate), Garlic, Paprika, Pepper Extract, Preservative (Sodium Nitrite). Instructions: Place one pizza directly onto the top shelf of a pre-heated oven and one pizza directly onto the middle shelf, for 16 minutes. Swap over the shelves halfway through cooking. Remove all packaging including baseboards.